Nicole is sick to death of friends urging her to get married again. Having lost her young husband in a traffic accident, she cannot face the thought of another relationship. Love hurts. She has told them, and told them, she does not want to marry again but still they persist. This goes on for months. Finally, she decides she has had enough and accepts a job as a software consultant in the UK where nobody knows her. Living in a 100-year old cottage in a quaint little village, she works her tail off all week in the high technology world but relishes country life on the weekends. When she meets her neighbor’s friend, a timid little homemaker called Emma, an unlikely friendship ensues. Emma’s husband, Adrian, has an enviable lifestyle – spending winters in Bermuda preparing material for the seminars he gives during summer in the States. While on tour, he meets an attractive business woman and falls in love. But, what to do about Emma? 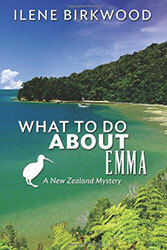 Months later, Nicole returns from a business trip to find that Adrian has taken Emma on a long vacation in New Zealand. When he returns without her, Nicole suspects foul play and sets off to search for her. The search takes her from the beautiful beaches of New Zealand’s sub-tropical North to the stark beauty of the Southern Alps. Along the way, she encounters danger, and an emotional turmoil that starts to erode her determination to avoid relationships.